A server crash, a hacker attack, or shoot through an update of the blog, or by installing additional plug-ins that may be the cause of your blog crash. Happy is he who has previously created a backup of the blog. 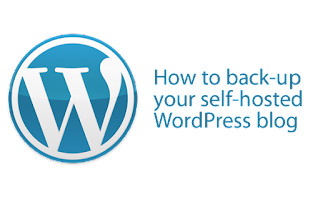 In this tutorial I will show you how to create a backup of the database and the files of a WordPress blog. The backup of the files is the easiest step. I am assuming that you are in possession of a FTP program, since you have the files of the blog also already uploaded to the server. If not, then just download Filezilla down , give your FTP data (server, username and password) in the appropriate boxes and move to the directory where the files are located blog. This is usually the html, www, or public_html directory on the server. In my case it is the folder / html / edp pour / on the server. Now you pull drag and drop all the files from your blog server, into a directory of your choice on your local hard drive. That was also the backup files. Here now all plugins that updates the templates and the changes to the templates have been backed up. To create a backup of the WordPress database, we get ourselves first a plugin . This plugin, we created a backup of the database and send it to us even by email. For security reasons, your WordPress not be older than 2.0.3. Which version do you use WordPress, you can see the back end on the bigger picture in the bottom right. After you\'ve downloaded the plugin on your computer, you unpack it and upload the file wp-db-backup.php with Filezilla in the WordPress Plugin Directory up ( wp-content/plugins ). Before it does, it must still be the back-end using plugins are activated. To configure the settings of the backup plug-ins, you go in the back end to manage / backup. On the left side (bottom), the plugin lists all database tables of the current blogs. The tables on the right are (in my example) to other blogs that I have are in the same database. We want to focus on this but your blog and therefore we leave the selection as it is. A little further down, there are other settings. Here you can specify whether you want the backed up files are emailed to you, or whether you wish to download them directly. For testing, I would load the database even on the computer. In addition, you can automatically create a backup and let it let you send a regular basis to your email address. It is also highly recommended, as you probably updating like to push on the back burner. So a regular update is recommended, especially when running multiple blogs. The blog files must be secured only by the way, if you change something on the template, or add new ones. The posts, comments, categories, etc., are stored in the database. Thats it already. You the most secure database stores in the same directory on your hard drive by You saved your WordPress files. Was not so difficult. For the effort you sleep a lot better for it! Which Plugin is better for backup ? Please tell me.